Arriving at the Twin Peaks morgue Special Agent Dale Cooper asks: Sheriff, what kind of fantastic trees have you got growing around here? Big, majestic. Sheriff Truman replies: Douglas firs. Cooper repeats in amazement: Douglas firs. His expression changes: Can someone give me a copy of the coroner's report on the dead girl? Trees played a central role in David Lynch's TV series Twin Peaks, symbolising both the splendour of the natural landscape as well as the horrific events that can take place within dark forest spaces. 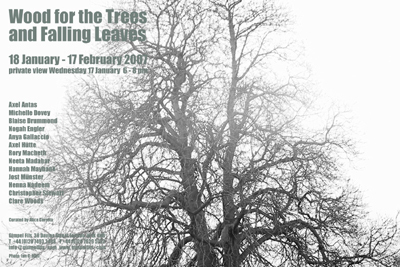 For different reasons and to different ends, the artists in this exhibition all use a tree (or trees) as a central visual component of their work. Drawing, painting, photography, film and sculpture are included here, and cumulatively the works encourage us to reconsider our own perceptions of, and relationships with, trees. Historically, trees have had enormous allegorical force representing both the beauty and fear of nature's sublime power. A tree is more than a tree: its canopy offers protection; it is a habitat, offering a home for other living things; a tree is a place to think and grow. The cyclical and seasonal nature of trees also offers us the analogy of new life and re-birth; outliving several generations they provide historical continuity whereby the past and the present intermingle. Simultaneously however, the sheltered wood and dense forest have come to epitomise the darker side of humanity; murky places that hide terrible secrets. Each artwork in this exhibition utilises tree imagery in an extraordinary way so that the common subject matter provides a pictorial entryway to other concerns. At first Nogah Engler's snowy landscape paintings appear uncomplicated, however, closer examination reveals disturbing details. Engler's forests include dead deer, watchtowers and nooses hanging from tree branches evoking the places in Ukraine where her father and grandfather hid during World War II. Christopher Stewart's photographic work also shows us the strange duality of fear and beauty. The work included in this exhibition depicts a forest watchtower, reminding us of Foucault's theory of the panopticon, where visibility is a trap. Photographing the reflection of trees in water, Axel Hütte's images contemplate the true nature of representation. Natural forms become indistinct, while figures stand waiting to be recognised. Trees, stumps and canopy are depicted in fluid glossy paint by Clare Woods combining both attractive forms and eerie mystery. Her work demonstrates a fascination with the supernatural and unseen presences. Jost Münster combines images of trees, roads, and blocks of colour to create imaginary landscapes. Using the spatial environments and the visual motifs of his urban surroundings he investigates the relations between colour, form and shape. Juxtaposing trees with images of high modernist architecture Blaise Drummond celebrates the natural world and its relationship to modern culture in his painted and collaged canvases. His work retains a hope in nature amid human constructions of progress. Axel Antas is attempting to slow down the process of looking by creating faint and delicate pencil drawings. His imagery is an investigation into the meeting of urban and a natural landscape; the gap between an untouched nature and your back garden. Working from eighteenth century paintings by Stubbs and Constable, Michelle Dovey gives prominence to the pictorial components often overlooked in art. Instead of being props or framing devices trees are joyously moved to the centre of her canvases. Henna Nadeem's digital prints combine found photographic imagery with patterns from non-western sources. In her work the British countryside and decorative motifs are grafted together as a reflection on identity and belonging. Rory Macbeth's hand carved trees evoke the spirit of Robert Smithson. Sculpted from real trees, following the curve of their branches, Macbeth's trees becomes art objects, at once representations of trees and trees themselves simultaneously. Neeta Madahar will show her film Falling in which sycamore seeds tumble slowly toward the viewer. In its tranquillity, the film evokes the passage of time and the processes of change, which also holds the promise of regeneration. Hannah Maybank also uses the tree motif as a tool to explore ideas of evolution, time and dissolution. Her layered paintings become three-dimensional objects as swaths of paint peel away from the surface. Anya Gallaccio's work has been concerned with the constant change and effects of time. In recent bronze sculptures she has halted time, challenging our perceptions of natural materials. She will be exhibiting new work in this exhibition.